Erica has been racing sailboats her entire life but at age ten she kicked her dad off the sunfish they always raced together and has loved skippering ever since. She taught herself how to race on a lake in NH and became competitive when skippering at the University of New Hampshire. Erica led the UNH women's team to a nationally ranked team (highest ranking 7th). She has been racing Lightnings, Etchells, and J24s competitively for the past 20 years. Jess and Erica started the Sea Bags Women's Sailing Team in the Fall of 2014 with the goal of qualifying for the 2017 J24 World championship. Not only did the team reach this goal, they finished as the top female team, with Spencer winning the top female skipper award. Skippering for this team has been one of the joys of her life but nothing compares to raising her two kids (ages 11 and 13) with her husband, in Maine. Jess grew up in her father's boat building shop and started sailing Beetle Cats, 420s and Lasers at an early age out of Chapoquoit Yacht Club on Cape Cod. It wasn't until moving to Maine 12 years ago that she got back into serious racing again. She now races out of Portland Yacht Club mostly on J24s and enjoys the road-trip aspect of away regattas. Jess bought her own J24 in 2014 with the intention of starting an all-women's team three years ago and joined forces with Erica in Erica's goal to qualify for a World Championship as an all-women's team. When not sailing, her favorite activities include yoga and spending time with her treasured Newfoundland dog named Pickle. Charlotte grew up in Maine where she raced in the junior programs at Sail Maine and at the Portland Yacht Club. She was immediately recruited to join the team upon its formation three years ago. For Charlotte, being on the water is a lifelong passion, as she enjoys all aspects of boating. She's a USCG 100 Ton Captain, a US Sailing Club Race Officer, a varsity high school sailing coach, and the District One Governor for the J24 Class. When not racing, she manages the largest marina in Kennebunkport, Maine. Kim grew up in Florida and began racing at the University of South Florida. She raced competitively in college and taught sailing during the summers on Nantucket. Kim has raced dinghies such as the 420 and Laser to keelboats such as J24, J70, Swann 42, and Melges 24 & 32. She's done well traveling internationally in the Snipe class and competed in many match race events in the Sonar and J22 classes. Kim is always calm, thinking big picture and keeping life on the boat simple. Her knack for creating one liner inspirational quotes on the fly, leaving the team laughing and repeating them all day is treasured by all. Kim has been with the team since the first regatta in 2015 and lives in Florida. Laurie grew up boating on Narraganset bay in RI and now lives in Freeport, Maine with her husband, daughter, and rescue dog. It wasn’t until 2000 in Casco Bay, Maine she caught the J24 racing bug. From that summer on she has raced on the pointy end of various J24s and Etchells. Laurie was a member of an all-female Etchells team many years ago and joined this all-female J24 team in the summer of 2015. While Carol spent her toddler years rambling around her parents’ Contest 30 on Penobscot Bay, she is relatively new to racing. A native of Kennebunkport, Carol spent her summers on the water and first learned to sail at summer camp. She credits her friend and neighbor Erica Beck Spencer with introducing her to racing. Carol first joined the team for Wednesday night races out of Portland Yacht Club in 2015. She lives in Portland, Maine with her husband and two children – one of whom is a budding racer thanks to Sail Maine. When she’s not sailing, she can be found buzzing around Casco Bay in an Amesbury skiff with her family. Fearless and curious, Sandy is a native Mainer with deep roots to Maine and the boating industry. She grew up in a boating family and has been a member of Portland Yacht Club since childhood. Sandy primarily races Optimists, J24s, Etchells and Lasers and is often found on the race committee boat helping her parents run races. Aside from sailing, she loves animals, singing and dancing. Despite being our youngest member of the team, Sandy is wise beyond her years and naturally jives with all beings of all ages. 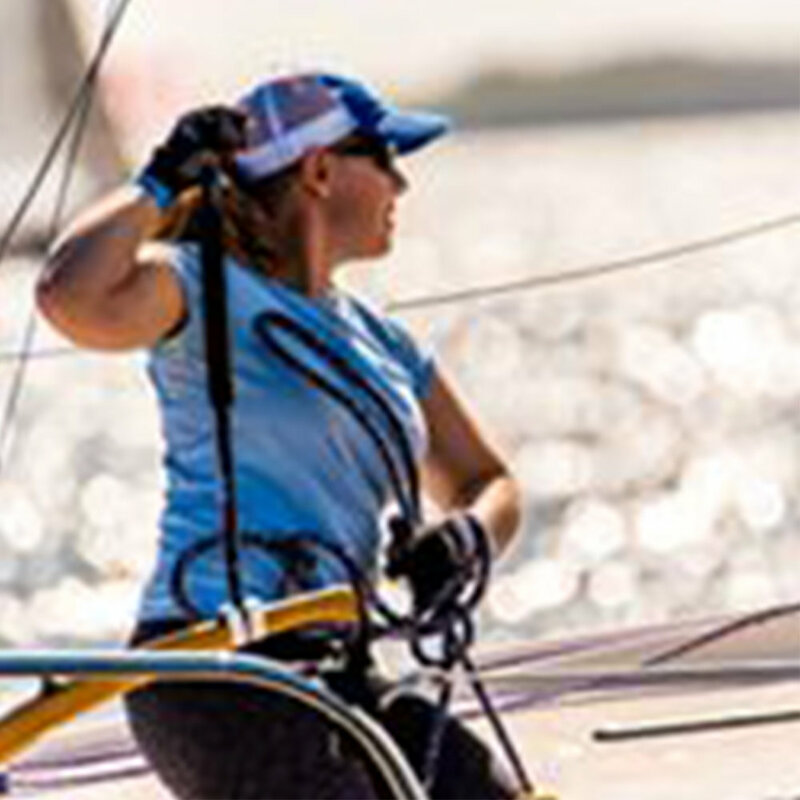 She was recruited to the team in 2015 for the J24 North Americans. Sandy is smart, competitive and driven, and the team feels fortunate to have her. As one of the younger members of the team and relatively new to J24 racing, Katie is eager to learn the processes both on and off the water that make for a successful regatta. Katie has spent her entire life surrounded by boats, therefore bringing a diverse set of skills in regards to boat maintenance and maneuvering. She joined the team in 2016 after tracking their travels and successes. Her admiration for J24s runs deep and she is now a second generation J24 Worlds Championship qualifier. Katie lives in Maine, works full-time and is working on her masters degree. Although new to the J24 Class, Hillary has been competitively racing for almost 23 years. She grew up sailing Opti's in Naples, Florida when she was seven years old, then moved up to Lasers, 420s and FJ's in high school and college at University of South Florida. In 2009 she began racing on a variety of high-performance teams in the following fleets: Melges 24, Melges 32, J/70, J/88, J/111, and is an active member of the Snipe Class. She has recently dipped her toes into the Etchells, Thistle, J/24, and Swan 42, and spends every Thursday night racing in her local J24 fleet in Newport. Hillary joined the team in the summer of 2016 and lives in Rhode Island. Joy Martin grew up in upstate New York reading and dreaming about sailing. Just out of college, having no clue that racing sailboats was an option, she talked her husband into buying a sailboat. She started racing at her local club and soon began racing Thistles all over the country with her husband. Joy also races on J22s and J24s and other boats as large as J44s. Joy has always been committed to supporting and competing in women’s sailing events from racing in a US Sailing Women’s Championship, two Women’s Rolex Keelboat Championships, and more than 15 Thistle Women’s National Championships (winning six). Joy became interested in this team after watching them compete in a regatta at Lake George, NY in 2015. She joined the team in the summer of 2016 and lives in NY. Karen grew up sailing at New Bedford Yacht Club and was a collegiate All-American crew at Connecticut College. After college, she won two Team Racing World Championships, two US Team Racing Championships, the Wilson Trophy, and V15 Nationals. Karen enjoys cruising with her husband, 4 and 5 year-old sons, and black lab aboard the 28 foot wooden Catboat her husband built. She also loves racing their Beetle Cat and in the occasional Sonar team race. She joined the team in 2017 and lives in Rhode Island.